For other uses, see Oleg (disambiguation). 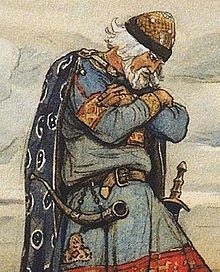 Oleg (Russian: Олег), Oleh (Ukrainian: Олег), or Aleh (Belarusian: Алег) is a East Slavic given name. The name is very common in Russia, Ukraine and Belаrus. It derives from the Old Norse Helgi (Helge), meaning "holy", "sacred", or "blessed". The feminine equivalent is Olga. While seemingly Germanic, "Oleg" is not very common outside of Eastern European countries. A written final 'г' (hard g as in 'gun') is pronounced 'k', with the correct result 'A-lék'. Thus, rather than "Oh-leg", the proper pronunciation of Oleg in English most closely resembles the name Alec, but with stress on 'E'. But care should be taken, since such а pronunciation is valid only when referring to Russian males with the name "Oleg". Ukrainian pronunciation of the name 'Олег' is different from Russian, though the same Cyrillic letters are used in writing. Ukrainian 'Олег' becomes 'Oleh' in English according to the transliteration rules and the name is pronounced as |ɔːlˈeɦ| (with unstressed |ɔːl| and stressed |ˈe|, as in already and soft |ɦ|). In Belarusian the name is spelled and pronounced as "Алег" so that the first letter changes to "A" according to Belarusian feature of akannye. The last letter is also pronounced differently which renders the Latin transliteration as 'Aleh'.